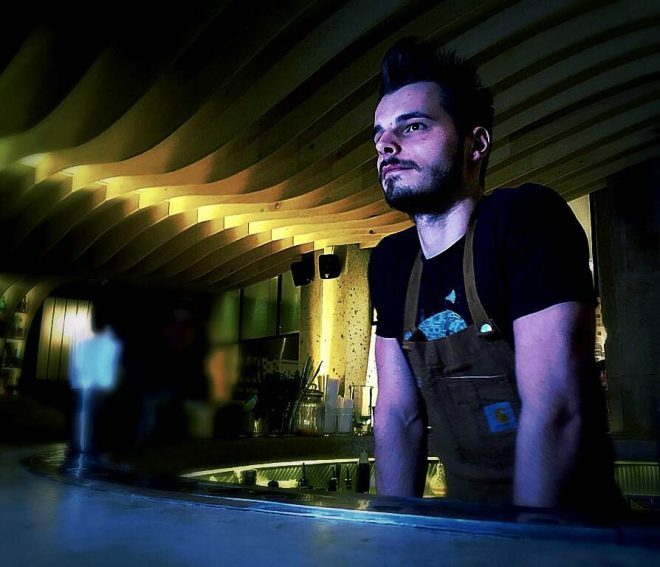 I’m Romain Briset, I’m 23 years old and I’m an apprentice bartender at Gravity in Paris. I am learning about classic cocktails, the history of spirits and methods of manufacturing them. I began my career working in a bakery, but it wasn’t for me, even though I have great memories of this period. I actually see many parallels and similarities between bartending and baking, like creativity, the correct balance of ingredients and creating pleasant flavours and textures. I left Brittany last year to come to Paris, because there are more opportunities here. Originally I applied for a job at Le Coq and they told me about a new bar in the area, which turned out to be Gravity. And, as you see, now I am here. The idea would to mix a bar with a bakery. I’d produce things like brioche syrup and use some grain based spirits for drinks. I’d definitely create some cocktails inspired by the flavours of pastries and baking. Also, I’d incorporate a bartenders station beside a bakery station, enabling customers to see both of them at work, sharing their drinks, breads and pastries (sweet and savoury). It would be an average sized place with 50 seats open to the world, not like a speakeasy. The interior design would be influenced by the bakery world with things like burlap bags on the walls. The music would feature soul, funk and reggae so people can chill out. When I am not working I try to go to different bars in Paris, like Mary Celeste or Candelabra, but I also want to share moments with my friends and not just focus on drinks. My favourite spirit is Xeres wine with it’s oxydative side. I didn’t know about it before I came to Paris, but it’s a very beautiful alcohol with flavours of nuts and dried fruits, it really matches with my project of a grain and brioche syrup. For me the definition of a good cocktail is about balance and individuality. I like working with products I am not used to drinking, like Quinquina an old aperitif liqueur. The ingredient I like to use the most would be lemon. The acidic side speaks to me and it was already an ingredient I loved to use in pastries. Go to a restaurant bar called Siseng, with Asian influenced cocktails.